A small group of very persistent parents and professionals came together to find a way to assist families with “emotionally disturbed” young children. Frustrated and angered because there were no programs for children with autism or pervasive developmental disorders, classified during this period as emotionally disturbed, they meant to do something about it. At the time, there was no right to education afforded to this group, let alone early intervention. PLEA (Parent’s League for Emotional Adjustment) was incorporated as a private, nonprofit agency. Begun as an advocacy and support group, this group sowed the seed for the development of programs for children, families and Adults with developmental and behavioral disabilities. PLEA opened the first center based program for children ages of 5-7 diagnosed with autism and other childhood disabilities. The Summer Camp was developed to provide structure and fun for children who needed special services during the time away from their special school programs. The center-based program obtained the Partial Hospital License from the Department of Public Welfare. The services for children was expanded to provide the Psychiatric component to the therapeutic school. In addition, to meet the needs of families, the Respite Care Program was established. This expanded the services of PLEA into the home to provide trained baby sitting services. The first adult programs at PLEA began when PLEA took over the responsibility for the Compeer Program and established a social group for adults with Autism, the PAL Program. PLEA obtained Provider 50 status and began an in-home BHRS service for children. PLEA was one of the first providers to use ABA training in home for children with Autism in Allegheny County. The center based school program expanded to include elementary school aged children. This programming was made possible and then expanded through training efforts at TEACCH in North Carolina, ABA at Princeton Child Development Center in Princeton, New Jersey and most recently, training at the Morningside Academy in Seattle Washington in Generative Instruction. Phase one of Compeer program expansion began. Private funding was obtained to begin a new service at a new location for Compeer. The Compeer Group match center was opened in Oakland and offered Compeer friendships by matching a Compeer volunteer with a group of 5-7 consumers with similar interests. The program follows the Compeer mission of fostering friendships through socialization. Phase two of Compeer program expansion began. The new Compeer Recreation Center, also located in Oakland, was introduced and offered additional services to the mental health community. The center offers and opportunity for friendships in a smaller, more intimate setting than other larger programs. The center based school program expanded to include a high school component. 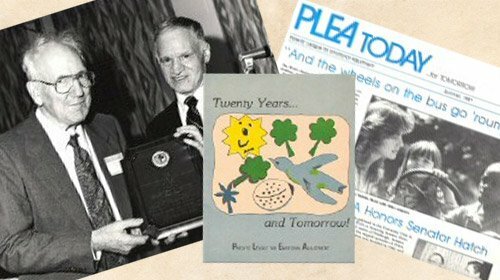 PLEA has come a long way since 1964 and now serves more than 300 individuals and families.